Above is picture of a 100 ft Hargrave with gelcoat which is 12 years old being refinished and layered with 3 coats of high shine, high durability ceramic coating. 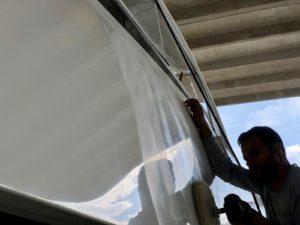 After a 4-step restoration polish Freedom Yacht Service detailers applied the Ceramic coatings undercover at Lauderdale Marine Center in Ft lauderdale, Florida. Ceramic coatings can give a yacht’s paint and gelcoat life many added years and higher gloss and clarity. Learn more today by calling Freedom Yacht Services for all your yacht refinishing needs. Learn more at http://ceramicpro.comContact us today for a Free Quote.